Andy Baxter completed his year as WM of Hartington Lodge No 1021 in a successful manner as he installed his successor Andy Greenwood in fine style at a meeting held in Barrow-in-Furness Masonic Hall. Pictured from left to right, are; Barrie Crossley, Keith Beaumont, Norman Thompson, John Quiggin, Andy Greenwood, Andy Baxter, Peter Schofield and Chris Butterfield. The outgoing WM has proved to be an excellent ambassador for the oldest lodge in Barrow during his term of office as he has enjoyed inter-lodge visits and the numerous social occasions. He can reflect with pride on his work on the day and on his service during the preceding 12 months. Principal guest on the day was John Quiggin. He was accompanied by fellow grand officers Rowly Saunders, Chris Butterfield, Barrie Crossley, group chairman Peter Schofield, Norman Thompson and Keith Beaumont. Norman is a Past PrGM and Keith is an Assistant PrGM of the Province of Cumberland and Westmorland. They were joined by several other brethren from that Province including the WMs of the two Craft lodges based in Millom. Pictured from left to right; are, ready for the off, Scott Deakin and Andy Greenwood. Also forming part of the procession into the temple were acting Provincial officers Barrie Fitzgerald, Reg Wilkinson, Les Newlands, Barrie Bray, Graham Dowling and Steve McKellar. 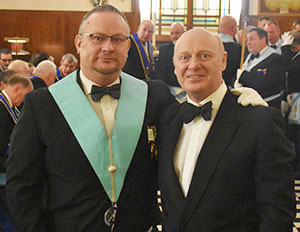 Andy Greenwood was presented for installation by director of ceremonies Graham Benson. Graham was later to receive well deserved praise for not only the manner he oversaw the ceremony but for the work he had obviously put in on the build up to the day to ensure such a high standard of ritual was achieved. Andy Baxter went about the job in hand in a delightful manner which was appreciated by all who were watching on. The deacons were addressed as to their duties by Reg whilst Steve undertook a similar role in respect of the stewards. 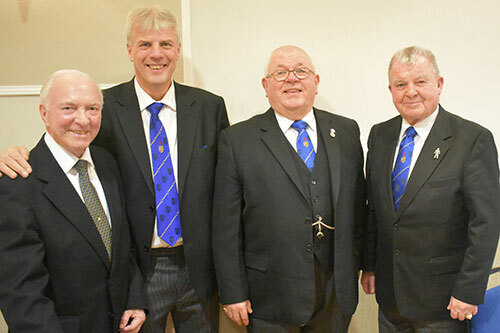 Keith Templeton delivered the address to the newly installed master, Harry Chatfield gave the address to the wardens and John was called into action to orate the address to the brethren. All played their part well as did Ken Boon who presented the working tools of an installed master. However junior members Arthur Lyness, Darren McBryde and Matthew Woods who presented the working tools were picked out for special praise. The trio performed their allotted tasks without prompt or hesitation in confident, clear and strong voices. When giving the greetings of the grand lodge officers Barrie Crossley, who is also a Past Provincial Deputy Grand Director of Ceremonies, who knows more than a thing or two about ritual, observed: “It would be unfair to say that the work of the junior brethren in presenting the working tools was good. It was in fact outstanding.” A well-deserved accolade. Pictured from left to right, are; Matthew Woods, Darren McBryde, Arthur Lyness, Andy Greenwood, group secretary Alan Pattinson, Ken Boon and Graham Benson. The lodge are fortunate to have Norman Thomas as the organist and his harmonies added to the pleasant atmosphere of the occasion. Andrew Greenwood has had a meteoric rise to the chair of Hartington Lodge having only been initiated three and half years previously, his proposer having been fellow ex-submariner and ADC Scott Deakin. This did not show as he displayed great authority and confidence as he went about the business of investing his officers. The new master served 34 years in the submarine service before taking up employment with the local ship-yard. As he commented: “I went from serving in subs to building them.” He also serves his community as a retained firefighter. Pictured from left to right, are; Norman Thomas, Ian Thompson, Harry Chatfield and Keith Templeton. One of those appointed was Andy Baxter, who was invested as senior warden. There is a slight hiatus in the lodge succession planning and Andy has volunteered to help out by, if things go to script, by returning to the chair next year. To mark the occasion the new WM presented John with a cheque for £1,021 in favour of the Masonic Charitable Foundation 2021 Festival. This is in addition to the £2,500 the lodge has previously donated to good causes during the preceding 12 months. The Fairfield Suite of the hall accommodated 134 diners who enjoyed the installation banquet. The arrangements for such a well-attended occasion had been expertly undertaken by lodge secretary Ian Thompson who was thanked for his efforts by John. Ken was called into action once more and sang the master’s song to the newly installed master. A raffle raised £983 for the hall building fund. With the addition of a donation from the visiting masters, arising from a sweepstake as to the length of John’s reply, and additional generosity from some present, this was very nicely rounded up to the more appropriate sum of £1,021. Hall committee treasurer Bill Glassey was on hand to quickly take possession of this cash and promised it would be faithfully applied in the ongoing work of updating the hall. The good food, wine and pleasant company proved a fitting culmination to an excellent afternoon and evening of Masonic ritual and camaraderie. Pictured from left to right, are; Steve McKellar, Les Newlands, Barrie Bray, Barry Fitzgerald, Andy Greenwood, Andy Baxter, Reg Wilkinson and Graham Dowling.